I have to admit I have something of a prejudice against oversized photo books. They try so hard—it seems such a coarse, obvious strategy to try to attract attention. Lots of "big" books aren't quite carried by the pictures inside them, many of which are simply reproduced too big, and despite their typical cost a lot of them aren't very well made—they tend to get loose and sloppy after surprisingly little handling. When talking about photo books, I care a lot about what you might call "the art of the book"—by which I mean the book as an art-object in and of itself—its design, the quality of its printing, its overall proportions and how appropriate it is to its contents, how it all works together, the "rightness" of the whole production. 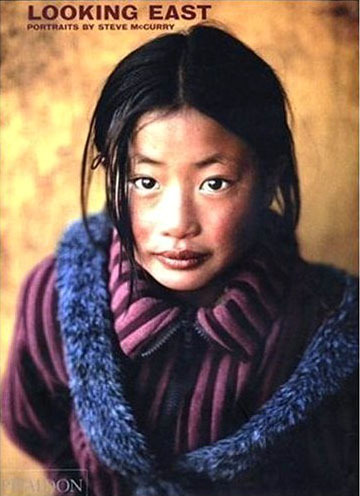 Anyway, here's a "big" exception to my bias against big books: Phaidon's Looking East: Portraits by Steve McCurry . The size works beautifully here with the images—I've just never seen these pictures look better in print, even though many of them have been reproduced many times in many places (yes, the famous green-eyed Afgan girl is present and accounted for, in ultimate form). Looking East is a great way to experience a fine selection of these wonderful photographs. The reproduction is top-flight, and the design is unusually unfussy—it gets out of the way of the pictures while adding just the right note of elegance. Okay, I can't stop with the dumb puns, but this is a "great big book." Look for it. An exception it is- with extremely lush, dramatic reproductions that exhibit an almost "painterly" quality... and moderately priced! The best Josef Sudek book is not the expensive and oversized Prague Panoramic but a 1950's Czech edition book called Josef Sudek. Regular size book containing his life's work and biography. Wonderfully printed and solid as a rock. More recent example is Jonas Bendikson's book called Satelites. Great work and interesting stories. Wow, Mike, you really have ESP. I was just admiring this book yesterday at my local B and N. I am a big fan of Steve McCurry. He really understands light. I agree wholeheartedly with the point at the beginning of the post regarding large books, a prime example being Joel meyerowitz's Aftermath, a that seems just a bit too convinced of it's own importance and reinforces it by sheer weight. I will check out the McCurry book as his best work is amazing, and if it's well printed it'll be a cracker. Well done on the year... it's becoming an indispensible site. While on the subject of books you all should check out the "Photobook: A History" volumes one and two. by Martin Parr and Gerry Badger. Amazing examples of photobooks from around the world including the history of the photobook . Great examples of books not normally available in the USA. randomrubble said:a prime example being Joel meyerowitz's Aftermath, a that seems just a bit too convinced of it's own importance and reinforces it by sheer weight. With all due respect I disagree.................to me this is clearly a case for going big. The impact of the images printed say, 8x10 or would be totally lost. These are not big for the sake of it. He is trying to offer a glimps of what is and will be remembered as one of the seminal events of our time. I saw very large prints of these in Chicago and they pack an even bigger punch. In many cases I agree..........not this one. Mike, I just picked up this book and love the finish on the prints. Do you think there is a comparable inkjet paper that would produce a similar finish? It's just what I'm looking for. I'm printing on an r2400.